The start of a fresh new story by Aaron Gillespie, andI can’t say I’m overly thrilled. I’m sure he’s a decent writer, but this first chapter seems terribly flawed, as Jessica goes on the run. “Framed for murder, now she prowls the badlands, an outlaw hunting outlaws, a bounty hunter – a RENEGADE!" Okay, maybe not quite, but given that her ring record every second it is in Jessica’s possession, Jess sure didn’t due much digging as what happened that led to her predicament, or why. And for someone with a history of crippling anxiety, she is amazingly calm to discover she is an intergalactic fugitive. And that’s my biggest issue with the story. Jessica overcomes her emotional issues, but that doesn’t mean she doesn’t have them. From what’s been said in past storylines, she is by no means “cured.” She continues to struggle daily, as many people do, to keep her balance. But fleeing through the cosmos, dodging all manner of aliens and space cops, seems to come second nature. 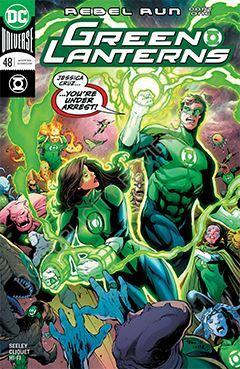 Ronan Cliquet is back at the drawing board; he’s perhaps my favorite GL artist in recent years. Which brings me to the subject of the variant cover by Warren Loww. Imagine a Disney-style drawing, heavily airbrushed to go on the side of your 1970s conversion van. Ick.